Heat oven to 350°F. Spray 9x5-inch loaf pan with cooking spray (without flour). In small bowl, mix flour blend, baking powder and salt; set aside. In large bowl, beat butter and granulated sugar with electric mixer on medium-high speed until fluffy, about 3 minutes. Reduce speed to medium-low; gradually beat in eggs and 2 teaspoons of the vanilla until blended. Gradually add flour mixture, beating on low speed just until combined. Transfer half of the batter to small bowl; stir in cinnamon. Alternately spoon plain batter and cinnamon batter into pan and swirl with knife. Bake 40 to 50 minutes or until toothpick inserted in center comes out clean. Cool on cooling rack 15 minutes; remove from pan to cooling rack. Cool completely, about 1 hour. In small bowl, mix powdered sugar, milk and remaining 1/2 teaspoon vanilla until smooth. Drizzle over cake. 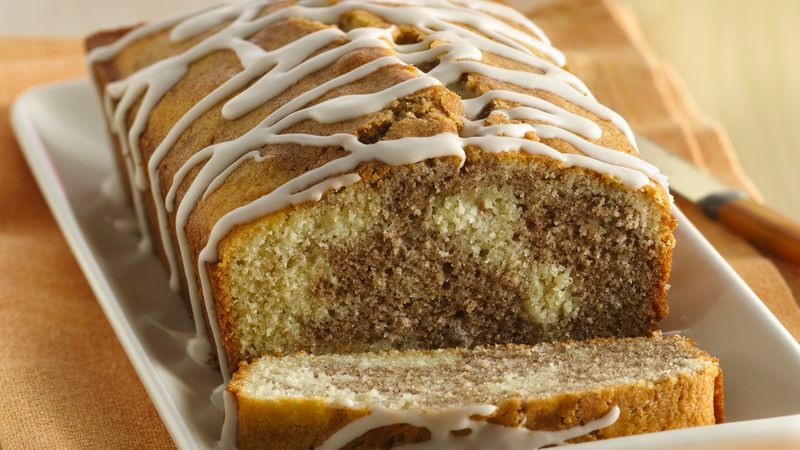 Have the eggs at room temperature when making this cake. If you forget to take them out of the refrigerator, just place them in a bowl and cover with warm water to take the chill off.